The plaque commemorates those who served in 54th Infantry Battalion during World War One. 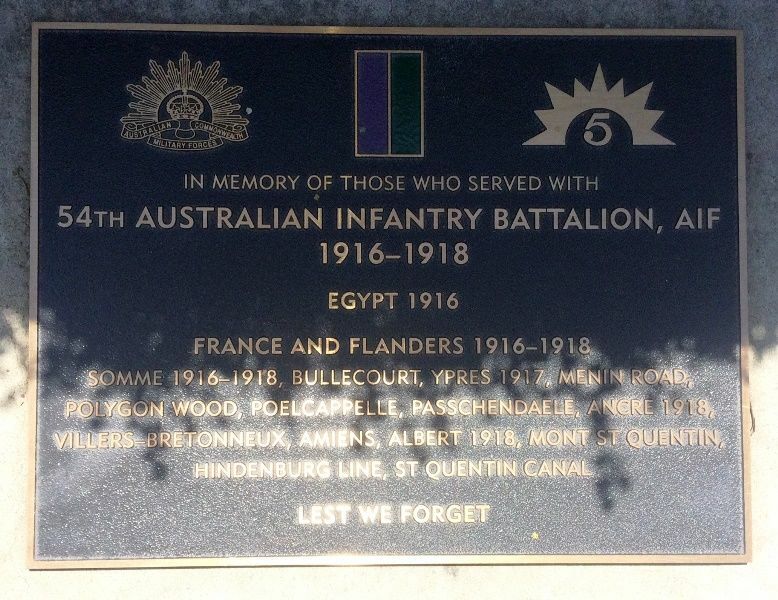 The Battalion was raised in Egypt on 16 February 1916 as part of the “doubling” of the Australian Imperial Force (A.I.F.) Half of its recruits were Gallipoli veterans from the 2nd Battalion, and the other half, fresh reinforcements from Australia. Reflecting the composition of the 2nd, the 54th was predominantly composed of men from New South Wales. The battalion became part of the 14th Brigade of the 5th Australian Division.